From cameras to lighting controls, On-Q® comfort products responds to your home's needs and lifestyle. Camera System enables viewing of camera images via the LCD Console or on any TV with the new TV Display Interface. System handles up to four weather-resistant cameras, and allows Internet monitoring when combined with IP Video Server. The On-Q® camera system, now available in the new Studio style, enables homeowners to view their camera images via a convenient LCD console or on any TV. Each system can handle up to four weather-resistant cameras, and allows Internet monitoring when combined with an IP Video Server. Built on Cat 5 cabling, the On-Q® Camera System includes easy installation features such as convenient RJ45 connections. lCD Console This 7" LCD Console features a high-resolution screen and can handle up to four video inputs, in addition to on-board sequencing of camera images. Available in four attractive Studio colors, the LCD is the perfect way to monitor the front door or nursery from any room in the house. Attractive design complements the home and matches other On-Q devices in the Studio design. 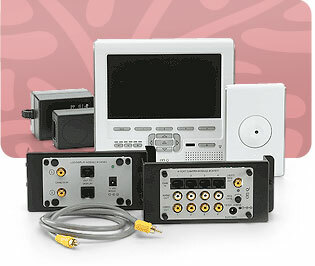 Simple push button interface to select desired input with up to four video feeds available. Controllable through an On-Q IR remote control. Category 5 Camera Module This Cat 5-based camera module supports up to four On-Q cameras and allows on-board sequencing of up to four images. Compatible with both standard bullet cameras and new ball cameras. Power supply required. Recommend F7726. LCD Module The LCD Module allows easy integration with the On-Q camera system. It supports up to four LCD displays and four camera inputs. Supports four LCD displays and four camera inputs. Enables camera viewing via TV with the TV Display Interface. Ball Camera Available in the new Studio design, the ball camera is an inconspicuous way to monitor a nursery, patio, or front door. Although it delivers crisp color video, it's also optimized for low light conditions to enable the best possible pictures in all situations. 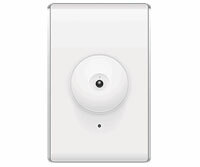 Delivers a crisp color image, includes Studio style plates for both in-wall and in-ceiling installation, and mounts in a standard single gang box with a convenient RJ45 connection.